​Of all the books which make up the Bible, the Psalms are arguably among the most popular verses used in the practice of magic. These verses are often prayed, in whole or in part, during the course of performing a spell. Typically, verses are chosen according to tradition or according to a personal interpretation of the text. Psalm 3: To relieve a headache or backache. Psalm 5: To obtain the favor of a magistrate or judge. Psalm 10: To be free of an evil spirit. Psalm 23: To receive instructions in a dream. Psalm 28: To reconcile with an enemy. Psalm 35: To win a lawsuit. Psalm 65: For success in all things. The bible is a popular medium used in the practice of stichomancy, or divination by books, although any book can be used in this practice. Practitioners often have their own systems of operation but generally speaking a question is posed while holding the book, it is then opened to a random page with eyes closed and one's finger is placed onto a page. The passage on which one's finger falls is then read and interpreted in relation to the question asked. Several rituals of divination have been devised which make use of the Bible. In the Hyatt material, folklore collected by Harry Middleton Hyatt between 1935 and 1970, mothers are instructed as to how to determine her child’s future. The mother is directed to take the baby’s first louse (singular form of lice) and press it randomly in a bible. The verse on which the louse was killed, it is believed, will foretell what is to happen to the child in life. In another instance, if a mother wished to know her child’s future profession she would place before the child a bottle, a dollar and a bible. If the child chose the bottle he would be a drunkard; if the dollar, a banker; and if the Bible, a preacher. There are several variations of this ritual which include other symbols such as a deck of cards for a gambler, or a hammer which would indicate a carpenter. Should a young girl wish to know the first initial of her future husband, she is advised to place a key in the bible with its head sticking out of the pages. She then places her finger on the key while reciting Ruth 1:16 (where you go there shall I follow…) and then slowly reciting the alphabet. The key is believed to turn once the letter of her future husband’s initial is mentioned. If the key does not turn, it is believed that she will not marry. A similar spell can be found in the magical tradition of the granny women of the Appalachian Mountains. The girl in question hangs a bible on a string and recites the given verse followed by the name of her beloved. It is said that if the bible turns on the string so that the open end would face the girl, then her sweetheart loves her and that they will one day marry. Similar procedures have also been reported for discovering a thief as well as taking off a spell. The Bible itself contains several instances where magic is performed and spells are prescribed. Though the practice of divination is mentioned earlier in the Bible, no method is mentioned or described until later in Genesis chapter 44:5 in which Joseph tests his brothers by having his servant hide his silver cup among their belongings. It is in verse 15 that Joseph admits to using the cup for divination. We can assume that Joseph’s method of divination is scrying, the act of filling the cup with water or some other liquid and staring into it as one would use a crystal ball to see visions. The book of 1 Samuels 14:41 describes a ritual to determine the identity of a sinner by repeatedly splitting a number of people into two groups and casting lots as to which group contained the sinner. In one instance, Saul and his son Jonathan are separated from the people and the divination suggests that the sinner is among Saul and Jonathan rather than the people. Later, Jonathan is identified as the sinner. A fair description of sympathetic magic, the belief that like attracts like, can be found in Genesis 30: 25-41. Here, Jacob makes an agreement with Laden to care for all of Laden’s sheep and goats which are speckled or spotted and all of the lambs which are black. At this time sheep were usually white, while goats were black or otherwise dark colored. Very few sheep would have dark spots and very few goats would have white spots. Jacob reasoned that if Laden should later check his flock and find any sheep or goats which are not spotted or lambs which are not black then it would be proof the Jacob had stolen them from Laden. Laden agrees and follows the arrangement. Jacob strips some bark from the branches of poplar, almond and evergreen trees to mimicking the speckled and spotted coats of the goats and sheep. He places the branches before their feeding troughs in such as way that the sheep and goats would have to see them as he believed that whatever the sheep and goats saw while they bred would determine the coloring of their young. When the lambs and kids were born speckled and spotted, Jacob was able to keep them as his wages for serving Laben and became very prosperous. Another example of sympathetic magic occurs in the book of 1 Samuel 6:2-12. These verses tell the story of how the Philistines became cursed with boils and mice after having stolen the Ark of the Covenant. To heal themselves of the boils and rid their land of the mice which devastated their crops, they were instructed by their Priest and fortunetellers to make an image of their boils and the mice in gold and send them with the Ark out of their lands and back to the Israelites. They believed that by ridding themselves of the golden images they would be rid of the boils and mice as well. The gold also served as an offering to God for having incurred his wrath. Similarly, in the book of Leviticus 16:21-22 , the High Priest ritually passes the sins of the people of Israel onto the head of goat which is then sent out of the city into the desert where it will presumably die taking the sins of the people with it. Yet again, in Ezekial Chapter 4:1-2, God instructs Ezekial to “…take thee a tile, and lay it before thee, and pourtray upon it the city, even Jerusalem: And lay siege against it, and build a fort against it, and cast a mount against it; set the camp also against it, and set battering rams against it round about.” What follows is a very long ritual in which a link is established between Ezekial himself and the city of Jerusalem, so that whatever occurs to Ezekial will befall Jerusalem as well. Finally, in the book of Numbers 15:12-31 a spell is given for a man who believes that his wife has been unfaithful to him which consist, in part, of the Priest gathering dust from the temple and mixing it with holy water. The Priest makes the woman swear an oath that if she has been unfaithful that the water will enter her and become bitter. It will cause her thigh to rot and her belly to swell. The curse is written down and washed away with the water and the woman is made to drink the water. Thereafter if the woman was unfaithful the curse will unfold as described; however, if she was not then no harm will befall her. Divination by the Bible is not limited to simply answering questions in a oracular fashion, in fact, you can use random bible passages to prescribe rites for your specific issue or condition. The Bible itself contains several instances where magic is performed and spells are prescribed. In the book of Leviticus 16:21-22 , the High Priest ritually passes the sins of the people of Israel onto the head of goat which is then sent out of the city into the desert where it will presumably die taking the sins of the people with it. The process for divining spells out of the Bible is precisely the same as that of divining answers to one's questions as described at the beginning of this article. The only difference here is that certain key words or phrases found in the text will serve as the inspiration for a spell or ritual. For example, let's say that you are interested in starting a romantic relationship with a certain person. You take out your Bible and ask the question "How can I gain (N's) attention and affection?". You open the Bible at random and blindly put your finger on Genesis 1:27 which states: So God created man in his own image, in the image of God created he him; male and female created he them. It isn't hard for the reader to draw a parallel between the creation of man by God who gathered dust, formed it into a man and breathed life into him and the process of creating a doll-baby and naming it after the person concerned. Therefore, based on this passage alone you may decide to construct a doll baby of both yourself and the object of your affection and ritually bring them together over a number of days, possibly even seven. The ritual could be accompanied by the burning of red-candles and love-drawing incense. In another instance, let's say that you have a client who comes to you believing that they have been crossed up. They complain that their luck has turned sour, they can't hold on to any money, and their relationships are no longer satisfying. 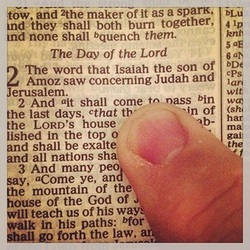 Once again, you go to your Bible and ask "Has (N) been crossed up and if so, how can he find relief?" and this time your finger lands on Psalm 108: 9 which states: Moab is my washpot; over Edom will I cast out my shoe; over Philistia will I triumph. The words that stand out to me in this verse include "washpot" and "cast out my shoe", which to me is a sign that perhaps someone had thrown for this person by possibly putting down powders that they had walked through. Therefore I would advise the person to burn their shoes and dispose of the ashes at a crossroads. I would also prescribe a foot-washing if not a series of uncrossing baths. Finally, the words "I will triumph" bodes well for the client being able to overcome the evil that has been directed at them. Finally, let's suppose that you have a friend that comes to and says she loves her job, she loves what she does but that her co-worker is just overbearing and is harder on her than other co-workers. She wants to know what she can do to have a better working relationship with him. You question your Bible and your finger lands on Psalms 104:34, which says: "My meditation of him shall be sweet, I will be glad in the Lord." In this example, the Bible is practically screaming honey jar! However, based on the word "meditation" and "be glad", I would also recommend that she refrain from having negative thoughts about her co-worker and his or her behavior. Instead I would recommend that she always greet them with a smile, and to simply expect to have only positive encounters with him. Of course these examples pre-suppose that you already have a basic understanding of spells, and how to craft them as rarely will a passage simply say something such as "at sunrise light a red candle anointed with Lavender Love Oil and pray Psalm 23 over it nine times...." The best way to get Bible verses for your own work is simply to read your Bible. When you read a verse or passage that speaks to your spirit, inspires a working, or provides a remedy for a current (or even past) situation then write it down. Today this formula serves as the basis for 7-11 Holy Oil, which is used in conjure practices for anointing and dressing people and things to bless them and infuse them with the spiritual power of the Lord. The Bible itself is regarded as a powerful talisman used in many spells and rituals for any number of reasons. The most common use of the Bible as a talisman entails placing one under your head at night so as to prevent nightmares, induce dreams, provide peaceful sleep, or bring prophetic dreams to name a few. In the days before medical care was accessible to the poor and babies where still delivered by midwives, a Bible was often opened to the book of Matthew (describing the birth of Jesus) and placed on a mother’s stomach to ease birth pains and speed up delivery. Before you enter a new home for the first time, it is said that you should lay an open bible on your doorstep then pick it up and go in your house so that you will be lucky so long as you live in that house. Another source states that a bible in which a dollar has been pressed should be the first thing brought into your new home so that its inhabitants will be righteous and will prosper in all things. It is believed that spirits will talk to you if you have a bible under your left arm and question it in the name of the Father, Son, and the Holy Ghost. In some cases, items of special significance such as a four-leaf clover or a child’s caul, can be pressed into a bible (either randomly or at a specific verse) to provide good luck to an individual. This presupposes a link between the individual and the item placed in the bible. The belief is such that as the bible preserves the four-leaf clover, for example, so will that individual’s luck also be preserved. The Christian bible is more than a mytho-historical mixture of accounts of God’s relationship with humankind. It contains a plethora of information regarding an array of subjects, which has influenced modern western civilization and world culture. In the practice of conjure, the Holy Bible serves many purposes such as being a tool for divination, a potent talisman, and a source of spells as well as prayers. As the practice of conjure and rootwork continues to fascinate the minds of a new generation of seekers and would-be practitioners we have only begun to penetrate the ancient secret hidden within the Word of God.